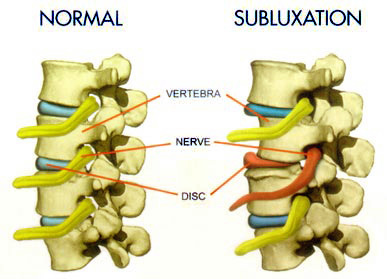 What are Vertebral Subluxations The term “vertebral subluxation” can be broken down as follows: Sub – less than Luxation – dislocation It is the result of improper positioning or motion of spinal bones with affect the nerve communication between body and brain. More than that, it’s a stress response. It occurs when spinal bones become locked, muscles spasm, and nerves rub together or are choked. When these happen, the regulation and control of our bodies becomes disrupted and therefore the communication between the brain and body is also disrupted. The reason this becomes such a major area of concern is because as the nervous system acts as the control center of the body (controlling organs, tissues, and cells) by relaying messages through the spine, it is essential to have a healthy spine. Otherwise, a wide array of diseases and physiological disorders can occur. Chiropractic adjustments are a natural way to reduce the negative effects of vertebral subluxations naturally without surgery. Rectification of vertebral subluxations is achieved through chiropractic adjustments which aim to change the motion and position of spinal bones gradually, by applying precise and specific force on the spinal cord. How to know if you have vertebral subluxations? During the early stages of vertebral subluxations, it’s difficult to identify that the condition exists as warning signs appear late, once the condition has progressed. It can be considered akin to attempting to identify early stages of cancer without a medical consultation. The only way to know for sure is to undergo thorough examination to identify the severity and location of any possible vertebral subluxations that may be present.